Anyone who knows me well will tell you that I don’t back down from a challenge. On the surface writing an article about combining the colors of orange and brown is something you would do in October, not in April, but bright orange and chocolate brown combinations are just as pretty during the entire growing season as they are at the end of it. Add a splash of white to your pots of orange and brown and you’ve got a unique container combination that you won’t see everywhere! 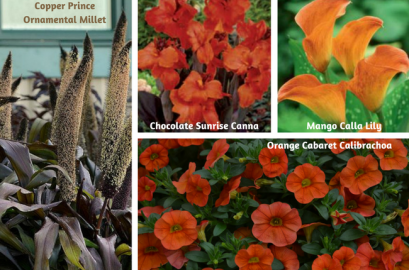 Don’t forget that if you can’t locate a flower that is orange or brown you can probably find a container in these colors as a substitute!